Last Monday I stayed at the new establishment of Doubletree by Hilton that's located in Jakarta. I think this is the first time I stayed in a hotel in my own city, haha. But I wanted to do it since a long time ago; to reward myself by spending a night or two at a five star hotel and do nothing other than enjoying the facilities. Finally, that day came and Doubletree by Hilton Jakarta – Diponegoro was my choice. So, how was the stay? The stay was great! That was exactly what I wished to get by staying at a Hilton hotel. I was welcomed by the signature cookie of Doubletree that was heavenly delicious. And what a smart move they have, they also sell the cookies at IDR 170k per can and you should definitely buy them because they were that delicious! 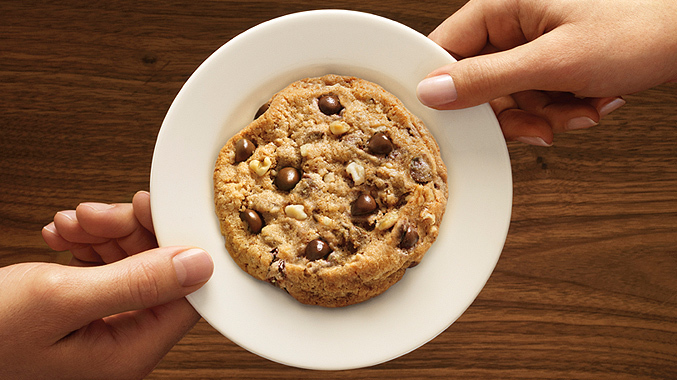 Doubletree's Signature Cookies. Pic credit: Doubletree's website. Then the night came and I just wished the morning didn’t come too fast as I still wanted to enjoy the night there. The bed, as usual coming from Serta’s bed, was super comfortable that it defines the meme that says “the bed won’t let you go”. The air con was cold and fresh but I didn't feel freezing as I was “hugged” by the blanket that kept me warm all the time. The next morning I got up freshly and enjoyed a lovely breakfast at Doubletree’s very own restaurant, OPEN Restaurant. As the name suggest, the restaurant offers an "open space" as they have an open kitchen and of course an al-fresco or an open dining area, just beside the pool. And for a breakfast place, OPEN serves a huge variety of food, from American, Asian and of course Indonesian style breakfast with its Nasi Kuning and friends. Other than that, they also serve fruits and some sweet cakes for desserts. Guaranteed a full and happy tummy afterwards. And the service was outstanding. The staffs were carefully watching the needs of the guests at each table. But, there was one let down, actually. I stayed at the Executive Room and got the privilege to enjoy the Executive Lounge, for an afternoon tea (from 2pm to 6pm) and evening cocktail (from 6pm to 8pm) in which they also provide some snacks that you can eat as your dinner. The food was nice and the ambiance was nice as well. However, the service was a bit disappointing for an Executive Lounge standard. The staffs weren’t attentive and proactive. They just sat behind their desk and didn’t "serve" the guests. They didn’t oversee the place and ask in case the guests need something or if the table needs to be cleaned up, unlike the service at OPEN Restaurant. If only the staffs were paying attention more to the guests, I think the overall experience at the Executive Lounge would be perfect. Nevertheless, my stay at Doubletree by Hilton Jakarta - Diponegoro was splendid and I can't wait to go back there again!